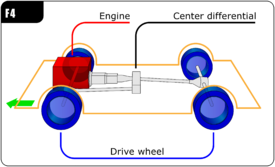 In automotive design, an F4, or Front-engine, Four-wheel drive layout places the internal combustion engine at the front of the vehicle and drives all four roadwheels. This layout is typically chosen for better control on many surfaces, and is an important part of rally racing as well as off-road driving. This page was last edited on 19 April 2019, at 17:39 (UTC).